On the road to Emmaus two disciples encountered Jesus as he explained the Scriptures and broke the bread. 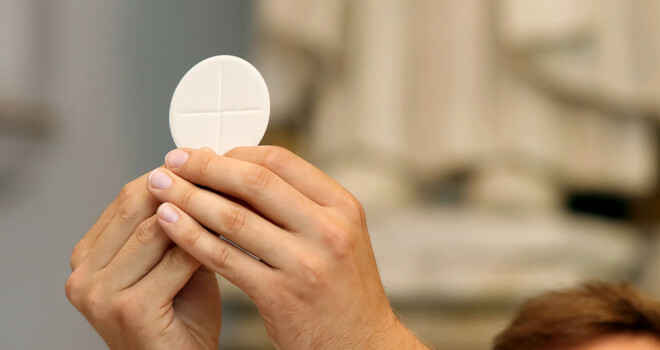 These two elements – Scripture and Sacrament – are the core of every Mass. As Christians have been nourished by the Eucharist from that very first Easter, may we continue to grow in grace every time we encounter the Lord in the breaking of the bread. This entry was posted on Sunday, April 30th, 2017 at 7:00 am	and tagged with Breaking of the bread, Catholic, Eucharist, Holy Communion, Homily, Inspiration, Jesus Christ, Mass and posted in Easter, Podcast. You can follow any responses to this entry through the RSS 2.0 feed.